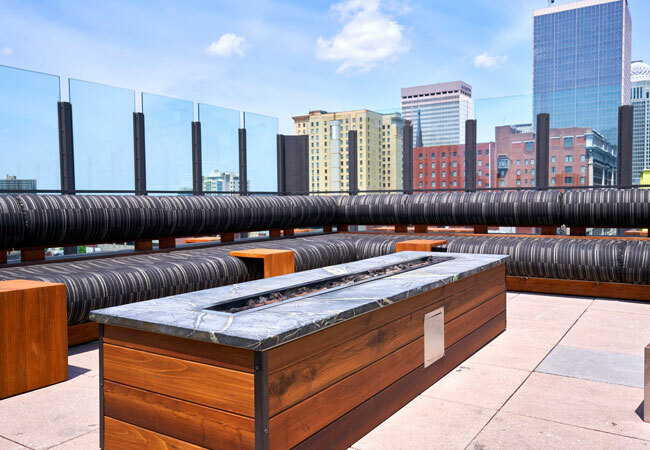 The name of your restaurant is 8UP Elevated Drinkery & Kitchen. As a chef, does it bother you that “Drinkery” is named before “Kitchen”? Honestly, it doesn’t bother me one bit. 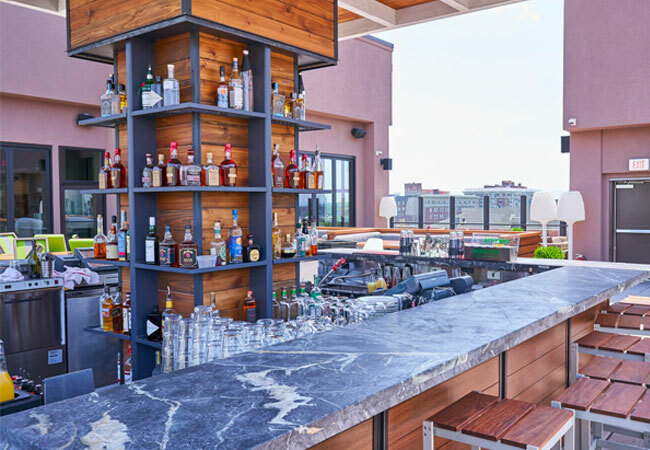 During the summer when the patio is open, the bar comes first. Sometimes in the summer I wish the restaurant was busier, but on the other hand, if I came in with my wife to eat, I would want to sit outside. We’re looking into offering a tasting menu that includes drink pairings and to having the food and drink be more incorporated as opposed to so separate. The theme of this issue of TOPS is “What’s Great About Louisville.” In your opinion, what’s so great? Louisville has all the culture you’d expect out of a big city: museums, restaurants, live music. But, it also has the appeal of lots of parks and ways to escape city life. When you want to escape city life, what do you do? Definitely camping. I own my own tent and I bring a shovel and my own toilet paper. The glamping thing seems like it’s an outside hotel. What’s your secret food indulgence? Don’t put five pounds of cheese in my refrigerator. They could be gone tomorrow. If you could have dinner anywhere in the world tonight, where would it be and with whom? In Paris with my wife. She really wants to go to Paris. And, now that spring is popping, just to go to one of the best restaurants in Paris and see what they do would be great. Any chance you’d like it so much you wouldn’t want to come back? No, I’d come back. I think there are better cities than Paris. If I were going by myself, I’d probably go to Bangkok and find someone selling food on the street and hope I wouldn’t get sick. I want to go to Mammoth Cave. 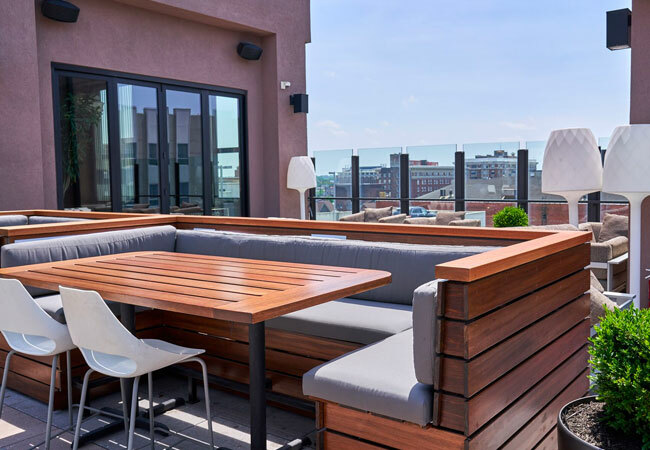 One of our city’s favorite rooftop restaurants just got a makeover and, before that, a new chef. If you think you’ve seen 8 Up, look again. 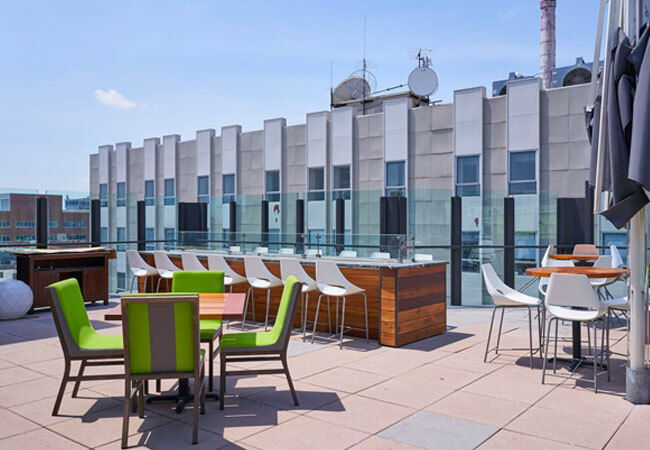 The sensational view from the rooftop of 8UP Elevated Drinkery & Kitchen gives the impression Louisville is putting on a show especially for guests who have discovered the upper level of the Hilton Garden Inn. Looking out onto the city is so spectacular, there’s the occasional comment of, “Gee, I can’t believe it’s Louisville!” It sure is Louisville, the new Louisville. Vibrant, exciting and surprises everywhere you look and everywhere you go. Are we southern or Midwest? Why choose? Let’s go with the best of both. 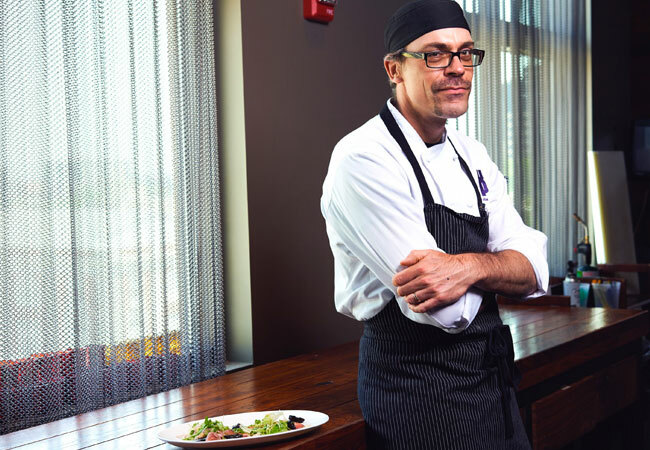 Casper Van Drongelen has captured the complex essence of Louisville in his Progressive American menu as he has slightly reimagined the cuisine since he was named executive chef about a year-and-a-half ago. “We have made the food a little more approachable, but that doesn’t mean it’s mainstream. During the summer we have quite a few out-of-towners. They come here with preconceived notions about Kentucky food. At 8Up they quickly learn that not everything is deep-fried and slathered in cheese,” he says. Certainly not, as is quickly evidenced by wood-fired octopus, chicken Lyonnaise and spaetzle carbonara. Installing an awning over the bar and refurbishing the furniture are part of the recently completed updates to the rooftop that Van Drongelen thinks stepped up the already swanky sexiness of the space. The visual changes had an invigorating effect on his approach to the summer menu. He’s more excited than he has been in a while about the menu and about food-centered events such as the pig roast that launched the renovated patio. It was so successful he and his team are considering hosting a pig roast once a month and may offer other themed outdoor food events. He predicts chefs’ and restaurant guests’ interests in molecular gastronomy and kitchen tools such as circulators are diminishing in favor of traditional cooking. Along with that, he’s witnessing a growing interest in pickling, preserving and fermenting. It’s a new direction to old practices he finds positive. 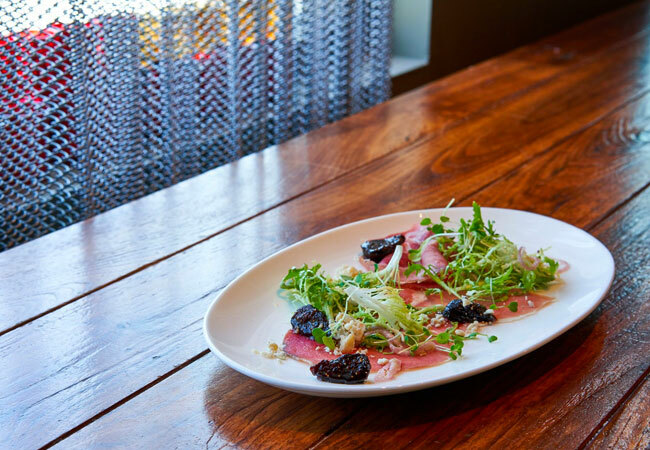 Dietary restrictions and diners’ very specific personal preferences have a profound impact on today’s restaurant dishes. As accommodating as Van Drongelen is to the growing phenomenon, he sometimes gets irked by how requests are made of his kitchen. “A restaurant exists to be sure guests have a good time,” he says. “If you don’t want mushrooms, you don’t need to say you have a food allergy for me to omit mushrooms from your dish. Or, people don’t need to say they’re allergic to pasteurized eggs because they want me to make an omelet with real eggs. Just tell us the truth and we’ll be happy to work with you." Place ham slices on each of four plates. Top with the fig mixture, then the arugula and spinach. Place wet ingredients in a medium-sized pan on low heat. Cook until the mixture reduces and dorms a syrup. Add the diced figs. Cover the pan. Simmer for 20 minutes.